In April, our sixteen Water I <3 U youth water leaders successfully hosted their community water action events in their communities! The results of all their planning are shared in their Water Action Plans on the Water I <3 U Action page (http://iffculture.ca/action/). Our fourth and final Water I <3 U workshop took place from May 5-9, 2014 and was hosted by the youth group from Shoal Lake #39. Elder Elladon Green opened the workshop with a prayer and welcomed everyone to sit by the fire outside her home where she and Elder Jim Green shared stories of their historical and present use of water. Elder David Daniels from Long Plain First Nation joined the youth group for two days and shared his wisdom and life experiences with the youth about storytelling and leadership. During the week, each group presented their water action, the outcomes, the lessons they learned along the way. The youth worked in their community groups to complete their community water action plans. They brainstormed action steps on how to create a community water action plan with tips and suggestions on how future youth water leaders can create a water action plan for their communities! Check it out here (http://iffculture.ca/take-action/how-to-guides/) The fourth set of the Water I <3 U digital stories capture their community water action event, and the challenges and successes of working together. (http://iffculture.ca/digital-stories/) The Shoal Lake #39 community hosted a celebration pow wow the first evening of the workshop. Two of the local youth, Realle, and Malik, put on their traditional regalia, and everyone danced and received a gift in the giveaway. Photo credits: Stephanie Yuill On our field trip day, we journeyed out to the Whiteshell Provincial Park and enjoyed a tour of the Whiteshell Fish Hatchery, and later hiked the McGillivray Falls trail, and spent some tourist time in Kenora, Ontario. We returned to Shoal Lake for dinner and to enjoy an evening of amazing fiddling music and learning how to jig! Photo credit: Stephanie Yuill The youth enjoyed presentations from the University of Manitoba H20 Create program, Health Canada, and International Institute for Sustainable Development (IISD) to learn about future water focused academic programs, the quality of water in the Shoal Lake watershed area, and larger watershed issues in the Hudson Bay Watershed, respectively. On Friday, each group shared their final digital stories with the Shoal Lake #39 Elementary School and participated in a water ceremony. We enjoyed a spring feast for lunch before heading to Winnipeg for our project celebration event at the Forks Market in Winnipeg, Manitoba. At the Celebration event, the youth spoke about how they will celebrate their successes at home and showed the final videos to a room full of guests and project funders! The Water I <3 U project is coming to an end but the impacts it can have on our youth water leaders lives and their roles as water leaders has only just begun! Great job everyone and good luck! Keep sharing how you <3 water, join the movement and live IFF! Sixteen Water I <3 U Youth Water Leaders, their chaperones and CIER staff enjoyed the third workshop in Yellowknife, NWT from March 23-29, 2014. Throughout the week, the youth were engaged in fun, interactive activities that explored Dene traditional teachings, hand games, and family games, learning about local and larger Arctic watershed water issues, exploring science and traditional knowledge systems, the art of persuasion and implementing change through the development of the action plan proposals. The youth enjoyed a tour of the Snow King’s Ice Castle, toured Air Tindi, where students checked out the floatplanes, and visited a local house-boater to learn and understand what it is like to live off the grid. Phil Fontaine, Former National Chief of the Assembly of First Nations, led a session discussing the art of persuasion and provided the youth with real life experiences on how leaders need to be masterful at persuasion in order to gain support for your causes. During this session, the youth did role-play activities where they pretended to be Chief and Council, and then Environmental Non-Government Organizations listening to youth-driven community action ideas. Another one of our evening activities was to go dog-sledding. The youth rode in pairs and took turns driving their own sled! We journeyed out along the Slave River and enjoyed hot chocolate at a cabin watching the sunset. On our field trip day, we visited the Dene community of Dettah where we travelled on a huge ice road and enjoyed learning how to play traditional Dene family games, hand games, and united as a group in a round dance to the beat of the drums. Later in the day, we visited the now closed Giant Mine, where we learned about the contamination issues of the mine and mitigation efforts. By the end of the week, each water leaders group had completed their Water Action Proposals as well as sixteen digital stories, which are now posted here on IFF!, and updated their timelines. The final workshop will be held in Shoal Lake #39 First Nation in Manitoba. The youth are working hard to complete their water actions. Stay turned to see what the youth accomplish and how they celebrate their successes with the Water I <3 U project! Protecting the water – one youth at a time. Yellowknife, NWT – Sixteen First Nation youth from across Canada are in Yellowknife next week learning more about how to protect water as part of their two-year long journey to strengthen their abilities as indigenous water leaders. Their Yellowknife trip is the third stop in their journey as part of the Water I <3 U Project. The youth are from four First Nations across Canada and have travelled to each other’s communities in the Arctic, Pacific, Atlantic and Hudson Bay watersheds. In each case they’ve witnessed first hand and heard from Elders about how water is the lifeblood of their communities; how it is rapidly changing; and the risks those changes create for First Nations families, livelihoods and culture. First Nations young people are more likely then anyone else to understand current issues with water, says CIER executive director Merrell-Ann Phare. “They are living on the land, their communities are often right beside rivers and lakes, they live on islands surrounded by water, and they see what happens when water isn't treated with respect. They know water is the foundation of life. These youth are witnessing changes in the quality and quantity of water - early warnings - that city dwellers are too far removed from to see quickly. These young people are the best equipped to raise awareness about the health of our water and our future. With the support of our funders, are proud to be working with this next generation of water leaders,” Phare says. The students gather every few months at each other’s communities to set long term goals and develop action plans to raise awareness of water challenges in their communities. “It is amazing the ideas they’ve come up with,” said Shianne McKay, CIER research associate. “Some youth are creating household tool kits for their community members on how to conserve water. Others are planning public workshops and will invite their Chief and Council to attend and some have plans to talk with elementary classes about taking care of the water,” McKay says. The Water: I <3 U project is funded by the RBC Blue Water Project, TIDES Canada, the Vancouver Foundation, The Thomas Sill Foundation, the Northwest Territories Government, and the Government of Canada. 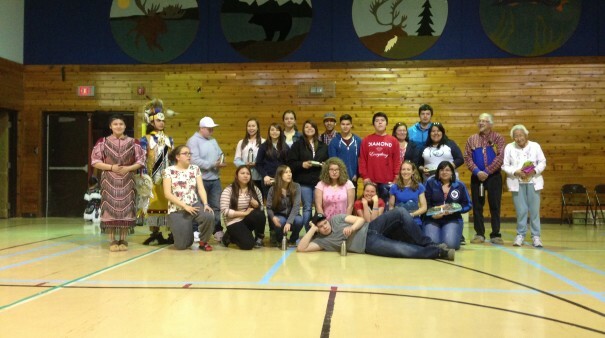 Northwestern Air donated flights for the youth from Fort Smith to attend the Yellowknife workshop. What has our IFF! contest winner been up to? We caught up with our IFF! contest winner, Jared "Qwustenuxun" Williams from Cowichan Tribes on Vancouver Island, to find out how he’s been enjoying his new Ipod touch and how he’s been living IFF! since the last time we talked to him. Jared is loving his Ipod touch and has been using it to take lots of pictures of his adventures with indigenous foods. He sent us some photos he took while mountain climbing, looking for the ultra-rare traditional food, ‘Thu-thoq’ (Prickly Pear Cactus)! He made a posting on the IFF! website, describing how they were traditionally gathered. He’s uploaded some other new plants and recipes, like traditional methods for cooking salmon and uses of stinging nettle, to the IFF! website, so make sure to check them out! Just one day left before we do our next draw for the second IFF! contest. Share your stories, recipes or videos about indigenous foods, so you can enter to win your own Ipod touch! We are excited to announce our winner of our IFF! contest: Jared "Qwustenuxun" Williams from Cowichan Tribes on Vancouver Island! Jared has won an Ipod Touch! He has posted lots of great stuff on the IFF! website, like stories about licorice root and fiddleheads and a recipe for cooking with a traditional bentwood box. We will keep in touch with Jared to learn more about how he is living IFF! and let you know what he has been up to. The next contest is up and running! Enter to win your own Ipod Touch! You can sign up now as a new member, or keep adding things to the website if you are an existing member. If you are an existing member, your entries now start over. That means for each new entry you share on the IFF! website completed from NOW, you will receive one entry for the contest. Check out the IFF site for contest details. Share your stories, recipes or videos about indigenous foods!